1. The operating table uses German imported hydraulic system operation, no leakage phenomenon, stable operation, low failure rate, long service life. 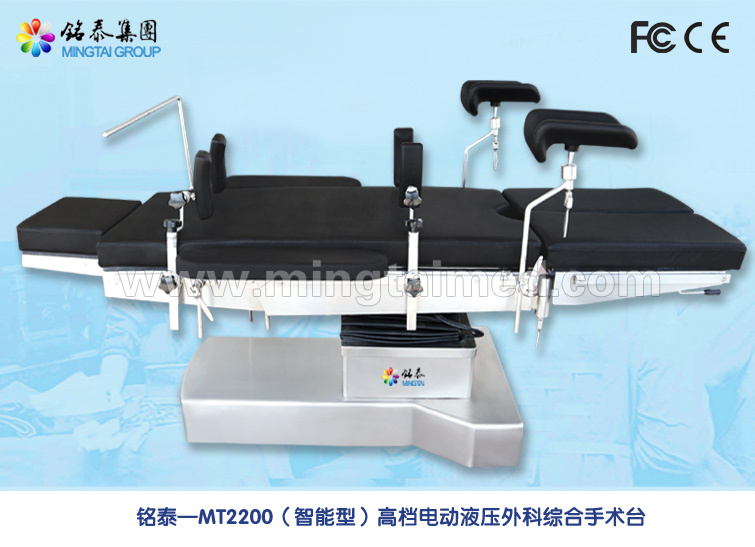 Operating table uses hand controller to operate bed lifting, forward and backward tilt, left and right tilt/backboard lifting, braking and releasing, and is equipped with the function that when emergency power shutoff, can brake with manual release. 2. "T" shaped base design, providing an active space for medical staffs` feet, and reduce the fatigue of the long surgery. 3. Optional universal USB communication interface, providing communication with the outside, can be integrated with digital operating room intelligently, with remote fault diagnosis function. Self-diagnosis and fault code display timely, easy to quickly find the fault position, timely solve failure, applies to the digital operating room. 4. Optional electric four-point intelligent electro-hydraulic brake system, when the floor is not smooth, it will automatically adjust to compensate, so the operating table is always in safe and stable condition, standard configuration with electric brake system. 5. Having one-key-resetting function,one-key-locking function, one-key- position function, double control system, easy to operate various functions of the operating table. Built-in rechargeable lithium battery. 6. Overall table is made of SUS304 stainless steel. Base and pillar cover is also made of 304 stainless steel. The mattress is with low pressure, memory, fire-retardant features and can prevent pressure sores. 7. Square lifting column is made by Germany, which has 4 times safety factor and 8 fasteners which can make it stable. 8. Optional manual control box panel has backlit display, easy to find the desired key in endoscopic surgery. A separate emergency button on the hand control box panel, an emergency, pressing this button to stop all operations, for the maximum degree of protection of patient safety. Looking for ideal Multi Function Operating Table Manufacturer & supplier ? We have a wide selection at great prices to help you get creative. All the Medical Equipment for Sale are quality guaranteed. We are China Origin Factory of Operating Table for Hospital and Clinic. If you have any question, please feel free to contact us.